~Media attention: The hospital has made the newspapers several times. As the most reliable hospital in the region (and the country), people care what happens to the hospital. How this crisis could affect Kudjip has been a concern for the public and highlighted how excellent the care at Kudjip is. This has drawn much needed attention to this national issue as well as brought specific support for Kudjip’s critical role. ~The government of PNG has responded to the crisis first by replacing a month of salary budget to all of Christian Health Services in PNG that was skipped last year. The National Department of Health also helped with some extra funds in February to Kudjip. Also even though every government budget has been cut, it has made it to the floor of Parliament that the cut to Christian Health Services should be reversed because of the care they give. We pray that will happen. ~NMI 100 year projects: God is not surprised by our needs. Some districts had already picked up some projects in the NMI 100 year that will help us with expenses such as containers, help other NHM divisions like CBHC, and continue to improve long-term systems such as housing repairs, which are also a great staff encouragement in these times. ~Keeping a discipleship emphasis: Some church donors have specifically helped continue staff spiritual retreats (see our recent post about how our staff’s growing sense of call has motivated them to give better care and even to sacrifice their own pay rather than continually increase fees.) The staff have been so blessed that we are continuing this spiritual discipleship program despite the difficult finances. It has shown them the importance of our own internal discipleship and really improves our care and sustainability to have people here with a deep sense of call to service. God is providing! Continue to pray for the administration as they navigate this financial crisis. Pray for the doctors and staff providing care. Pray that the hand of God will clearly be evident through this time. ‘Tis the season for critter catching. The rain has let up for a bit as the sun is warming the days. Bug jars have come out along with the blooming tulips and daffodils. The rule at our house is that frogs and snakes may be kept on the back porch (NOT in the house) since they seem to find any little hole to crawl out of. Ladybugs and boxelder bugs are allowed in jars in the house. The kids are always on the look out for new little critters. Several times they’ve caught a moth in the jar and a few days later the inside of the jar is covered in tiny little eggs. These are watched closely until they hatch and itty-bitty caterpillars are inching all over the jar. We also have bird feeders on the back deck and bird watching has become a favorite mealtime activity (and a distraction during school time). As we’ve prepared for moving to PNG the kids have wanted to research what animals await their discovery. There are marsupials related to those that live in Australia, like the Tree Kangaroo. A Cuscus is a slow moving animal about the size of a cat and sometimes mistaken for a sloth. The male Bowerbird creates an elaborate bower and dances around flashing his feathers to attract a female. A few years ago we watched a video of this, so we plan to watch it again before leaving. Do you have any guesses as to what is the top predator in Papua New Guinea? I was surprised to find out that it is the Harpy eagle as there are no large mammals that are predators on the island. It will be an adventure as we explore the wildlife next fall! During my last two years at Northwest Nazarene University I worked in the mailroom. It was a job I enjoyed and my competitive nature showed up here, even if it was against myself. I would try to memorize where every name was on the boxes so I could beat my previous time in getting the mail delivered to each box. Occasionally someone will ask if I know a person who attended college the same time I did and if I didn’t know them personally I usually recognize their name from the mailroom. Many mornings I worked alongside Wayne Larson. 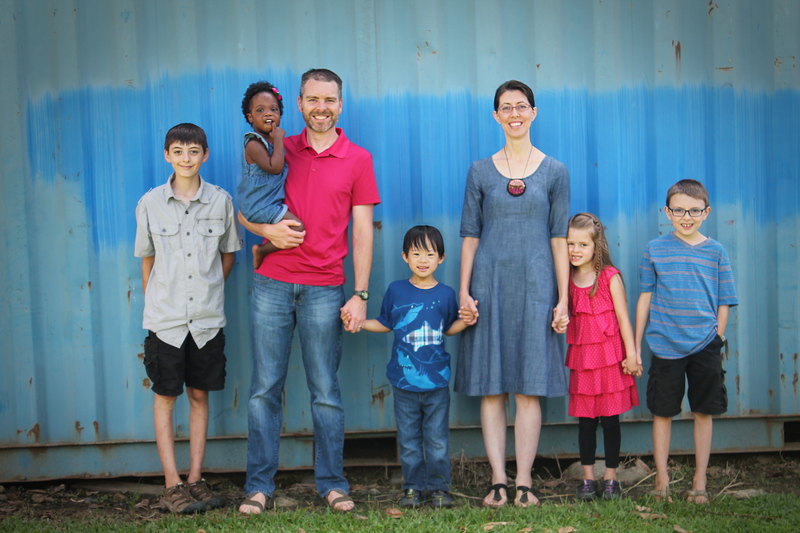 He and his wife, Joann, ran the mailroom, but had spent many years as missionaries in Swaziland, South Africa and Papua New Guinea (read more about their work here). Little did I know while I listened to stories from their travels that 15 years later I would be preparing to move my family to Papua New Guinea. In February I traveled back to Nampa to share with several groups about God’s work in PNG and His call on our lives. One of the missions groups ended up meeting at the home of the Larson’s son. He shared with me a little more about their work in PNG. Wayne served as the hospital administrator and trained a man from PNG to take over his job. This man named his son Wayne Larson and Little Wayne hopes to one day attend NNU. Nathan’s college roommate, Jeremy, spent time in Papua New Guinea as a missionary kid. He has been very encouraging in this upcoming adventure. God has used texts and e-mails from him at times we’ve been feeling discouraged to help us refocus and know that God has things under control. We are grateful for his encouragement. As we’ve shared about our upcoming move it’s been fun to see how many connections other people have with PNG.